There are many reasons to study Hebrew. A person may be going on a trip to Israel, considering converting to the Jewish faith, wanting to better communicate with Hebrew speaking people, or studying historic Hebrew writings. Every reason is valid. There are many books and other study aids for learning Hebrew, some better than others. It is worth the time to look at ratings and decide which books are the best ones for learning. Textbooks can be a safe, reliable way to learn Hebrew. Books for Learning Hebrew can cover the Hebrew alphabet, grammar, reading, and writing. The complete addition of Living Language Hebrew: This is the one to get if a person is only purchasing one book. It comes with nine CDs and three books covering everything from beginning Hebrew to advanced Hebrew. It is a good program for self-study that includes a lot of practice materials. This book covers writing, speaking, and reading Hebrew. Learn to speak Hebrew with This book. The book Teach Yourself To Read Hebrew focuses solely on reading Hebrew in 92 pages and 10 lessons. It is very good for beginners. Though it is quick and direct, there are no practice exercises included. Another useful book is A Step by Step Guide to Modern Hebrew. This is modern, not biblical Hebrew so it may be more practical for the learner. The reader starts the lessons with the seven verb groups along with the conjugations. At the end, a person should be able to complete many sentences and recognize common patterns in Hebrew. This is a book the learner should use in conjunction with other books that cover vocabulary, reading, and phrases. 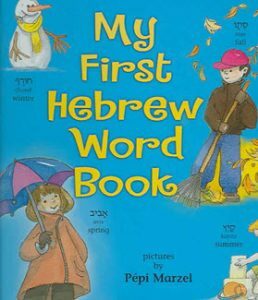 My First Hebrew Word Book is an easy introduction to Hebrew with only 32 pages. This might be the book to take on that trip to Israel. The pages are divided into subjects such as family, food, clothing, weather, and so on in both Hebrew and English. The reader learns beginning Hebrew with the help of both words and pictures. If a person wants to master grammar, The Routledge Introductory Course in Modern Hebrew is worth considering. This 384-page book will take the learner from beginner to advanced status with a lot of practice and review. The many dialogue examples are a great break from studying the rules. This is a book that helps people who want to improve their speaking and communication in Hebrew. Once you know the Hebrew alphabet, Hebrew: A Language Course Level One is a 243-page textbook that helps the learner read sentences and paragraphs. It will help with both reading and writing effectively in Hebrew. If you want to go beyond books, you can use a computer-based alef-bet tutorial from HebrewResources.com. The level and reason a person is learning Hebrew will determine which books and other learning aids will be best. Everyone learns in their own way. Some people prefer to learn online with tutorials, while others prefer books or CDs. For many, a combination of learning aids will have the best result. For more information on learning Hebrew, please visit the website.